And… that’s pretty much it. Anything else I could say here would just be reiterating his biography, which I try to avoid doing too much in these writeups. The most unique thing about Valeros is that he likes to fight with two swords. The standard Knight template is more than enough to cover that, and unlike the d20 Fighter it actually lives up to its reputation as an effective combatant. 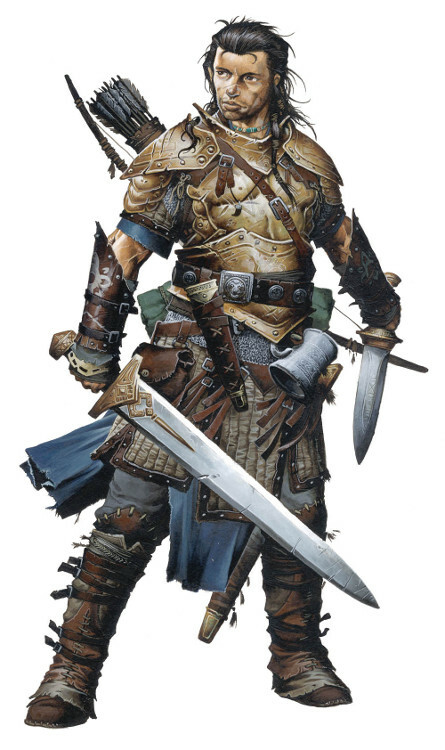 As you can see below, our version of Valeros wields two full-sized broadswords instead of a longsword/shortsword pair, because there’s no restriction preventing him from doing so in GURPS. The Two-Weapon Fighting power-up is from DF 11. He spent 2 of his character points in starting cash. Mail Shirt [Torso]: DR 4/2*. $150, 8kg. Heavy Leather Leggings [Legs] DR 2. $60, 2kg. Heavy Leather Sleeves [Arms] DR 2. $50, 1kg. Boots [Feet]: DR 2*. $80, 1.5kg. Pot-Helm [Head]: DR 4. $100, 2.5kg. Large Knife [Torso]: Damage sw-2 cut, thr imp. $40, 0.5kg. Regular Bow [Torso]: Damage thr+1 imp. $100, 1kg. Thrusting Broadsword x2 [Torso]: Damage sw+1 cut, thr+2 imp. $1200, 3kg. First Aid Kit [Backpack]: $50, 1kg.